The London Festival of Architecture had a bright and early start today with the opening procession for RIBA's Nash Ramblas event. This celebrates the architect John Nash's plan for the development of the area between St James' and Regent's parks commissioned by the Prince Regent in 1811. The event began at 8:30am on the steps of the Duke of York monument where architect Will Alsop, dressed as Nash, launched the world’s first water and solar powered wheelchair lift. He was joined by the director of CABE, Paul Finch, and developer Roger Zogolovitch, each dressed as the Grand Old Duke of York and the Prince Regent respectively. They then proceeded up Regent's Street in a horse-drawn carriage to lay a wreath at the bust of John Nash on the steps of All Souls Church. From there Finch was to go on alone to march up to the top of Primrose Hill, and apparently then march back down again. While this struck me as an excellent jape, when I joined the procession at All Souls around 10am it seemed that the 8:30 start may have been a little too early for most. With my own exhibition to finish installing, it was with regret that I left the Duke of York yet another man down. Obviously by far the most important event is my own: Transparency and the City: Public Spaces or Forgotten Places. The exhibition will run from Monday 21st of June to Friday 2nd of July, and will be hosted by the gallery at Alan Baxter. 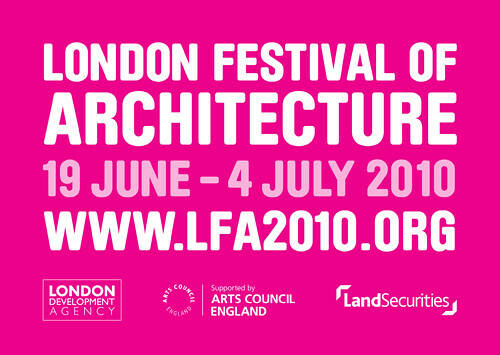 A full list of events can be found on the LFA website here. Throughout the festival I'll be posting any interesting links I find on my 'Top Links' list to the right of this page. If you hear of any other exhibitions or events that I might be interested in, or if you would like further information about my own, please get in touch and let me know. Looking forward to seeing you there.